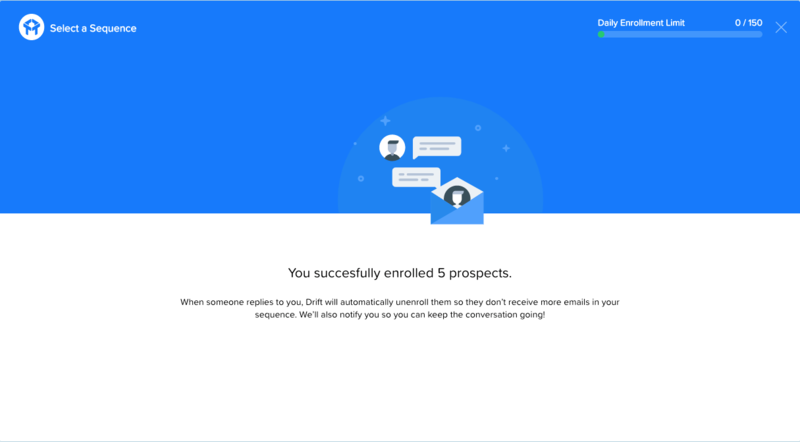 Using Drift Sales Sequences, you can manually enroll leads in a nurturing email flow that can be personalized! As a Drift user, marketing teams hand hot leads to sales reps constantly after qualifying them through LeadBots and Playbooks. Occasionally, leads won't be ready to buy but sales will want to be able to contact them later to nurture them through an email sequence. Being handed great leads from chat is great for Sales teams who can close deals with CQLs, but nurturing leads with email sequences is a traditional part of the Sales process that occurs outside of chat. Enrolling these contacts in nurturing sequences can help you get those contacts back onto your site and ready to buy! This process used to occur outside of Drift, until now. Good news - you can manually enroll leads from your contacts view into email sequences in Drift or in Salesforce! You must have your Gmail connected to Drift for this to function! Connect here. You will also need your Gmail connected for replies to show up in the Email Sequence Report. The Sales Sequences you create will be under Playbooks in Drift. So the first thing first - we have to create one! Head to your Playbooks tab and hit the green "New Playbook" button and select "Email" to head to the Marketplace. You'll want to create a "Sales Email Sequence with Gmail" Playbook. Customize your emails the way you'd like! When you add a link to your email sequence, we'll rewrite that link with an ID token so that you can know the visitor's email right when they drop on to your site after clicking the link. But, we only rewrite links to your Drift profile and company URL, so people won't be recognized following a link to another page you installed Drift on. This eliminates the need to create multiple sequences for each rep! Calendar links, Signatures, and Meeting Times will change depending on who is sending the sequence. When you add an email, you will have the ability to space out your sequences the way you'd like and decide whether or not to thread them together. When someone clicks on a link to your site from a sequence, the sender's photo will display to greet the lead and continue the conversation in real time! To determine WHO will receive these sequences - keep reading! When you are done constructing your Sequence, don't forget to add a title to your Playbook, save your changes, and publish it! Before you enroll a lead in a sequence in Salesforce, you will have to download our Google Chrome extension. You can do so here or check in your account settings here! Once you have the extension downloaded, you can click on any contact or lead record you have in Salesforce. On their page, you should see a new button on their contact record that says "Enroll in Sequence"
From there, you will choose which sequence you want to enroll your lead into! We only allow you to send 150 sequences a day so that you don't go over your Gmail limit. You can lift this limit on the Company plan in Settings under Conversations > Advanced. If your sequence uses personalization tokens, they will use information from the Drift contact attributes for the contact matching your recipient's email; the tokens will not use information from the Salesforce record. We will also use Clearbit Enrich's database to provide names etc. where it can, and use this in favor of conflicting information on the Drift contact to be sure you're sending with the most up-to-date data. Use a default value for the personalization token in case there's no match from your Drift contacts or Clearbit! 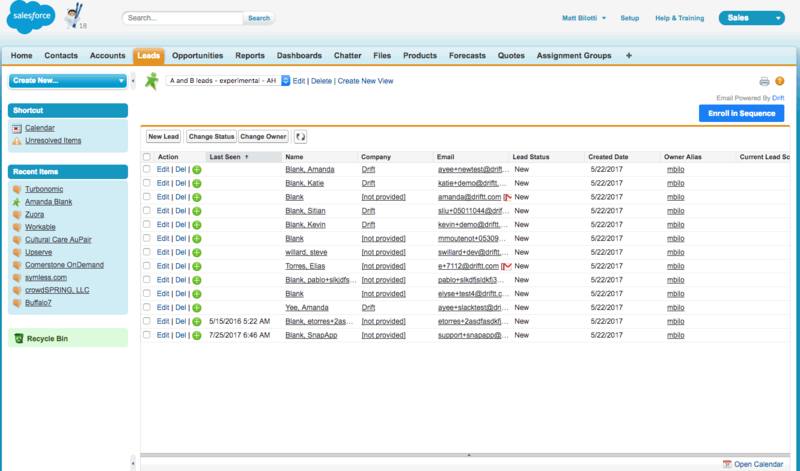 If you want to add a list of contacts into a sequence, you can do so in Salesforce! In your Salesforce Leads Page, you can select a list of leads you've configured. You can enroll contacts in Sales Sequences via the Contact and Leads views of Salesforce Lightning. At this time, you cannot Bulk-Enroll via Salesforce Lightning. Drift is not found in the App Launcher. Instead, you will see the option to "Enroll in Sequences" within the Contact and Lead views. Here's where you'll see Drift in Salesforce Lightning. If you want to make sure to add more personalization to a Sequence before you send it out, you can edit your sequence in Salesforce! Make sure you only select one user on your list in order to edit the sequence. That will change the sequence for that one user so you can add your own touch to the sequence! Choose which Sequence you’d like to enroll your users in. When you click that button, you will need to hit "Enroll" to confirm. It may be the case that you haven't created any sequences yet when trying to enroll. You will be prompted to "Create a Sequence" and can follow the flow from there! A user will always become unenrolled if they reply to one of the emails in the sequence. Even if you receive an automatic reply, for example, an OOO message, this is still considered a reply. That contact will be unenrolled from the sequence. Replying to an email isn't the only reason you'll want to stop sending somebody a sequence of emails. Maybe they booked a meeting, started a new email thread, or had a conversation with you on your website. With Drift sales sequences, we make sure that your engaged leads stop getting your rep's emails. To note: forwarding is not included in these triggers that cause an unenroll. You can also choose to unenroll someone from a sequence if ANYONE from the same domain name replies to a sequence email, as to not spam the organization. You can find this under the "Advanced Options" section in the email playbook builder on the left hand side. You can also manually unenroll someone from a sequence by going to their contact page from the contacts view and clicking "Unenroll in Sequence"
If a lead wants to unsubscribe from your sales sequence emails, there will be email preferences at the bottom of your sequences where users can stop receiving your emails with one click. If a lead does unsubscribe and you are trying to enroll them into another sequence - you will be alerted with the following message. Have more questions? Chat with us!